User experience (UX) designers aim to create a product that causes a pleasant emotional reaction in order to generate an enjoyable memory. However, emotions are subjective and diverse because of cultural differences. As a consequence, cultural differences in UX design are often considered only as theoretical exercises. 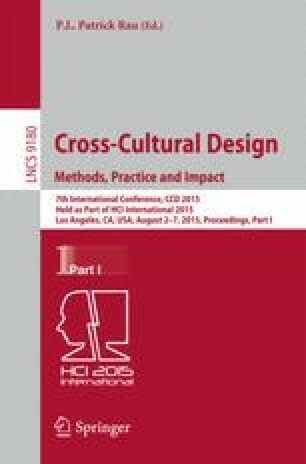 In this paper, we aim to bridge the gap between theoretical cultural studies and practical application. We analyze established cultural dimensions as well as notes from observational studies, business presentations and ethnographic interviews. Finally, we present “Cultural Personas”, application-oriented tools that characterize derived cultural differences. That supports designers to consider a culturally sensitive UX and thereby to develop better, more enjoyable products.